With the current surge in detoxing programs, the demand for apple cider vinegar is exploding today. Even though the benefits have been well documented since ancient times more recent studies have shown that apple cider vinegar can help with balancing blood sugar levels, support weight loss goals, lower cholesterol and even support healing of acne and scars. Apple cider vinegar is made by crushing apples and squeezing out the liquid. It then undergoes a fermentation process to form the enzymes and probiotics that are responsible for its health promoting effects. The end result is a product that has much less calories than apple juice or apple cider. 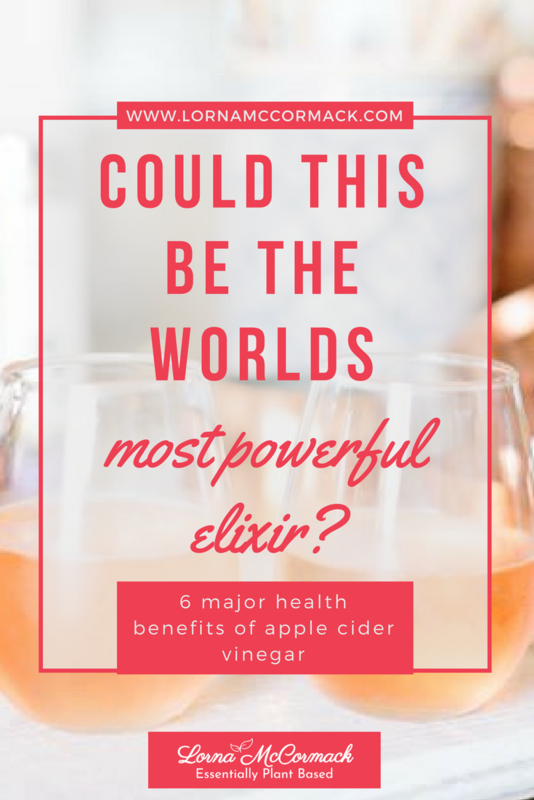 With an extensive list of uses and health benefits this is a staple in my pantry and all I need is one or two tablespoons of apple cider vinegar every day to reap the benefits. My favourite of Braggs Raw Apple Cider Vinegar. Apple cider vinegar can support heart health by keeping cholesterol levels low. Dietary cholesterol is consumed in all animal foods (meat and dairy) and when consumed can lead to a build-up of a fat-like substance in the arteries forcing your heart to work harder to circulate the blood. This is one of the most researched benefits of consuming apple cider vinegar. It was found in one study that drinking apple cider vinegar after eating white bread reduced blood sugar levels by on average 31percent. In addition, apple cider vinegar can be used as part of a diabetic healing protocol. A study showed that apple cider vinegar ingestion improved insulin sensitivity by up to 34 percent in people with type 2 diabetes. To balance blood sugar levels take one or two tablespoons of apple cider vinegar before consuming meals. There is a growing amount of research now confirming the weight loss benefits of apple cider vinegar. One study showed that over a 12 week period adding two tablespoons of apple cider vinegar each day, with no additional dietary modifications led to a weight reduction of 4 pounds. However, do not use apple cider vinegar alone, purely for weight loss. For maximum long term results combine it with a lifestyle filled with fruits, veg, nuts seeds and beans and legumes (which are particularly powerful for promoting weight loss). Like having high cholesterol, high blood pressure forces the heart to work harder. Consuming apple cider vinegar daily will make your heart stronger. Other natural ways to lower blood pressure include increasing your fibre intake by eating….you guessed it…more plants. Plants provide the only source of fibre in your diet. By introducing more acid into the stomach, the acid backflow that causes the discomfort can be relieved. Also known as acid reflux or GERD, heartburn usually happens as a result of low levels of stomach acid. The apple cider vinegar will help restore the acid levels for proper digestion. For best results, take one to two tablespoons of apple cider vinegar with water just before eating. Apple cider vinegar can also be used to treat acne and heal scars. It’s well known anti-bacterial agents are highly effective against bad bacteria that can be at the root of acne. A study from the Journal of Cosmetic Dermatology used lactic acid (a component of apple cider vinegar) to treat acne. After three months the participants reported improvements in appearance, texture and pigmentation. If you only change one thing this year add this drink to your morning routine. Ideally you would drink this first thing in the morning, before having breakfast. If you are using apple cider vinegar to combat any of the issues mentioned above, in addition to this daily morning drink you can consume apple cider vinegar throughout the day before your main meals. Mix all the ingredients together and ideally drink at a warm temperature. Your turn: What do you use apple cider vinegar for?